We are always looking to add to the Songbirds Flock! Here are some answers to the questions you might have about joining the choir. Where and when are rehearsals? We rehearse every Monday evening, arriving at 7:15pm for a prompt 7.30pm start until 9pm at the United Reformed Church in Windsor Place, Cardiff, CF10 3BZ. Do I need to audition to join? We are a non-auditioning community choir with a great mixture of abilities. If you enjoy singing that’s plenty good enough for us! Do I need to be able to read music? How will I learn the music? We generally work from lyric sheets rather than scores. Rosie sings a phrase to the choir and we sing it back to her, building up the parts until we’ve learned a whole song. Once you have joined, you will be added to a private Facebook group, where you will be able to access our Dropbox, full of recordings to practice at home. Rosie leads the choir in a warm-up, in which we pull some very silly faces, wake ourselves up, stretch our vocal chords and think about our singing technique. After that we spend some time learning notes for a new piece, or practicing something we already know. After an hour or so we have a short break for chatter and refuelling. We take turns (sectionally) providing snacks and this is a great opportunity to get to know each other. If you struggle with talking to new people, contact us in advance or find one of the Committee and we will help you settle in, meet you outside for your first visit or accommodate you however we can. At 9pm, we occasionally dive next door to the pub. We are an exceedingly social bunch! For your first rehearsal, you don’t need to bring much. We’d recommend a pen for making notes on your lyric sheets, and a bottle of water. You might find it helpful to have a folder to organise your lyric sheets, which you should then bring to each rehearsal. How much does it cost to be a member? What am I paying for? Each member of Songbirds pays £20 a month (£10 for unwaged Songbirds) as a subscription fee. The first two sessions are free, until you settle in. Subscription fees cover the cost of the rehearsal venues, our MD Rosie, accompanists for performances, music and the arrangements of songs, performance venues and other miscellaneous costs associated with running the choir. Any profit from subs goes directly back into running the choir or subsidising opportunities for members (e.g. choir festival subs). While we encourage you to come and perform with us, this is not compulsory. There is no pressure – if you would just like to attend rehearsals, crack on. We’ll be equally pleased to have you either way. Can anyone join Songbirds Choir? Songbirds is open to all self-defining LGBT+ women and non-binary people. This means lesbian, gay, bi, trans, queer, asexual, pansexual and any other non-heterosexual/cisgender identities. We would like to emphasise our inclusivity of non-binary people and promote our stance as being open to anyone other than self-identifying men. So as long as your identity falls somewhere in the spectrum and umbrella of that, you’re very welcome. That said, we appreciate and welcome our straight and/or male-identifying allies as audience members at our performances. If you want clarification or further information on any of this terminology, Stonewall have a pretty comprehensive glossary. Why should I join Songbirds instead of a choir open to all women? This is a personal choice. 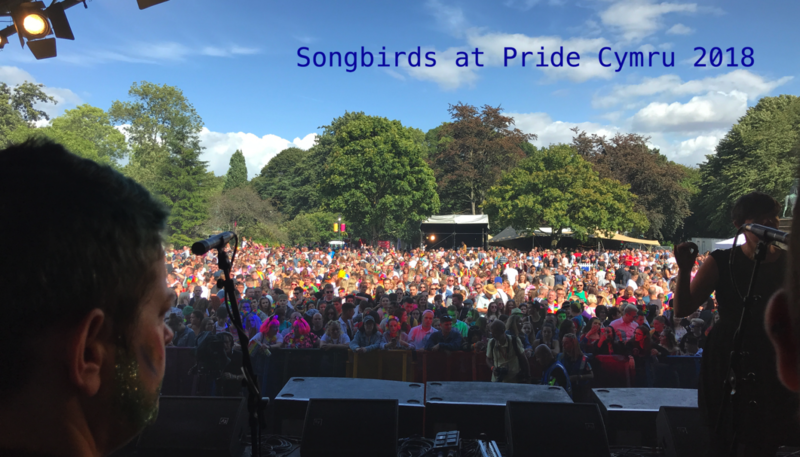 Songbirds also works to provide a space where LGBT+ women and non-binary people can meet each other away from the ‘scene’ and work together towards a common goal, in an environment where there is a level of understanding that is often not available in wider society. This can play a vital part in helping us to accept ourselves for who we are and developing a stronger support network of like-minded people to share our lives with. Will becoming a member of Songbirds ‘out’ me to friends, family and work colleagues? We are unapologetic about our status as a choir for LGBT+ women and non-binary people, and many of our gigs are at events associated with the LGBT+ community in Cardiff. However, we are sensitive to the situations and needs of our individual members. If you would like to be left out of photographs and other media used in the promotion of the choir, please ask and we will respect that. We also operate a no-tagging policy to avoid accidental outing via members’ social media accounts. Sounds great! When can I join? You can join whenever you like. We hold fairly regular ‘open rehearsals’ which give anyone the opportunity to come along and see what we do, but you are more than welcome to join any Monday evening just by turning up. If you want to meet someone beforehand to calm your nerves, drop the Committee a message and we will arrange to walk in with you.